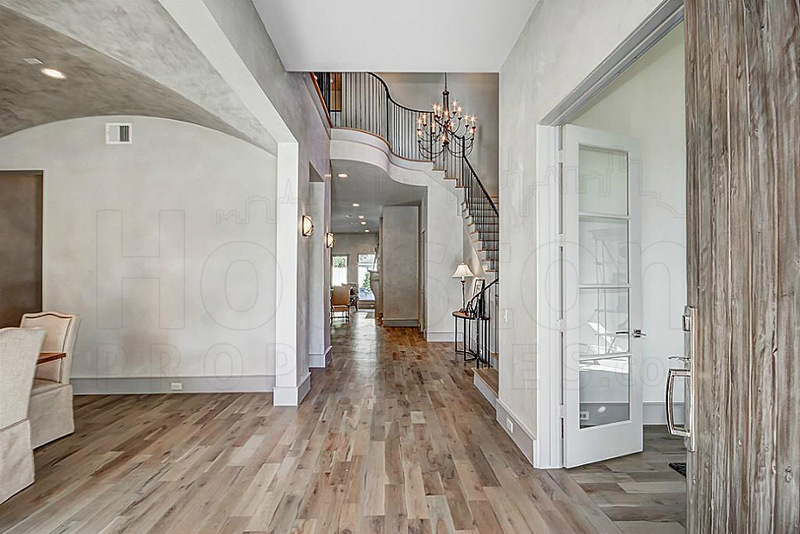 Located just outside the Inner Loop and within the prestigious 77024 zip code, the affluent Bayou Woods is home to luxury mansions on large, wooded lots. 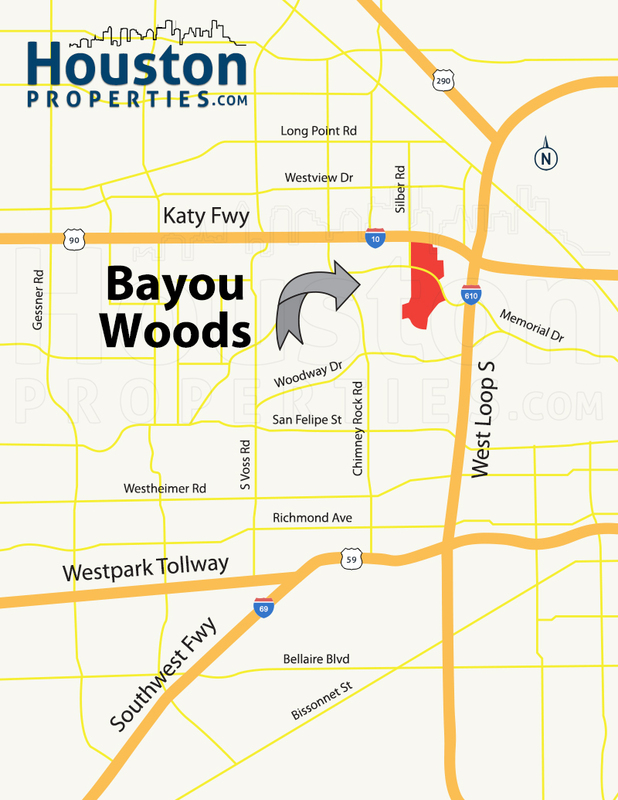 Nestled near the corner where Loop 610 and Interstate 10 meet, Bayou Woods is around 6 miles away from Downtown Houston. EXCLUSIVITY: One of the affluent Memorial close-in neighborhoods, Bayou Woods real estate are among the most expensive in Houston. Median sales price of homes in the community is at upwards of $4,000,000. MEMORIAL CLOSE-IN LOCATION: The Memorial area, specifically the 77024 zip code, is home to several affluent neighborhoods. The Memorial Villages, Tanglewood, Stablewood, and Bayou Woods are all known for luxury mansions and upscale homes on sprawling lots. NEAR EXCITING GALLERIA: The Galleria area is one of Houston’s main employment districts. It is home to more than 23 million square feet of office space – with 2,000+ businesses and 50,000+ employees. Home to the world-famous Galleria mall, the district also features over 5 million square feet of retail space (400+ commercial establishments). GREAT SCHOOLS: The neighborhood is zoned to the highly-rated Spring Branch Independent School District. National Blue Ribbon schools like Hunters Creek Elementary, Spring Branch Middle School, and Memorial High School all serve Bayou Woods homes. NEAR MEMORIAL PARK: Memorial Park is one of Houston’s largest urban parks. The former military training camp now houses several sports facilities, miles of hike and bike trails, and the Memorial Park Golf Course. LARGE LOTS: Lots in the neighborhood are between 20,000 to upwards of 100,000 square feet. Bayou Woods homes typically feature wooded grounds, wide setbacks, and sweeping driveways. Buying and selling a home in Bayou Woods can be challenging due to limited inventories (very few homes put up on the market every year) and proximity to main roads and freeways (which can hurt resale). 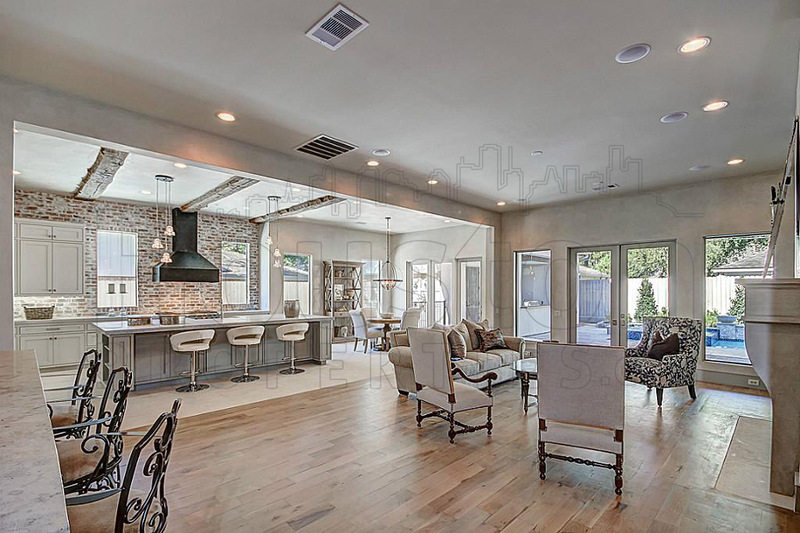 Contact Paige Martin, one of Houston’s Best Realtors and one of Bayou Woods’s most active real estate agents, if you’re looking to buy or sell Bayou Woods homes for sale. Enter your email to get this free Bayou Woods guide in easy-to-read PDF format. Bonus: Also see how this area compares with nearby top neighborhoods. I am interested in Bayou Woods and would like to get more details. Bayou Woods is made up of about 120 homesites and is located in one of the state’s most expensive zip codes, 77024. 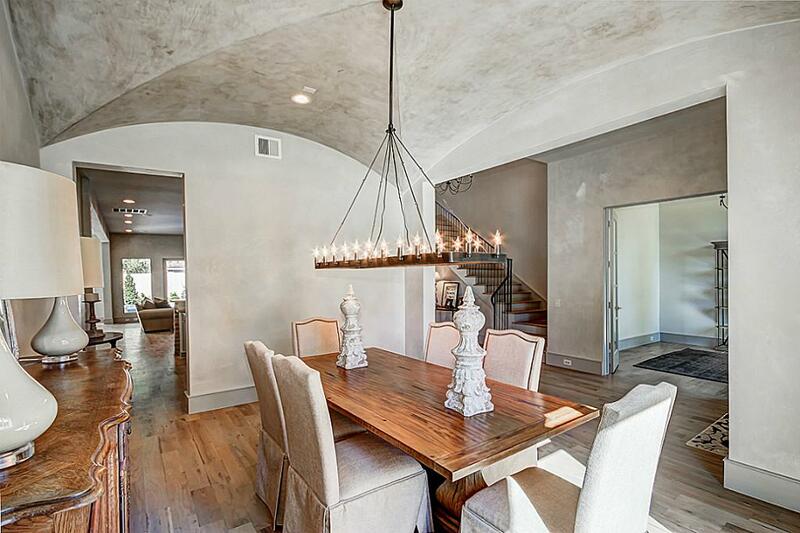 One of the affluent Memorial close-in neighborhoods, Bayou Woods real estate are among the most expensive in Houston. Median sales price of homes in the community is at upwards of $4,000,000. The Memorial area, specifically the 77024 zip code, is home to several affluent neighborhoods. The Memorial Villages, Tanglewood, Stablewood, and Bayou Woods are all known for luxury mansions and upscale homes on sprawling lots. Uptown Houston (The Galleria area) is one of Houston’s main employment districts. It is home to more than 23 million square feet of office space – with 2,000+ businesses and 50,000+ employees. Home to the world-famous Galleria, the district also features over 5 million square feet of retail space (400+ commercial establishments). Memorial Park is one of Houston’s largest urban parks. The former military training camp now houses several sports facilities, miles of hike and bike trails, and the Memorial Park Golf Course. The neighborhood is zoned to the highly-rated Spring Branch Independent School District. National Blue Ribbon schools like Hunters Creek Elementary, Spring Branch Middle School, and Memorial High School all serve Bayou Woods homes. Lots in the neighborhood are between 20,000 to upwards of 100,000 square feet. Bayou Woods homes typically feature wooded grounds, wide setbacks, and sweeping driveways. Main roads and freeways are minutes away from Bayou Woods homes. Memorial Drive cuts through the area, while Post Oak Lane, Loop 610, Katy Freeway (I-10), and Woodway Drive are all easily accessible from the neighborhood. Developed during post-WWII housing boom, most homes in Bayou Woods date back to the 1950s and 1960. Many have been updated or torn down in favor of bigger and newer homes. The neighborhood still exudes an old world, country-living atmosphere. Homes in the neighborhood often offer luxury amenities like swimming pools, well-kept lawns, formal dining and living areas, spacious master bedrooms, and outdoor receiving areas. 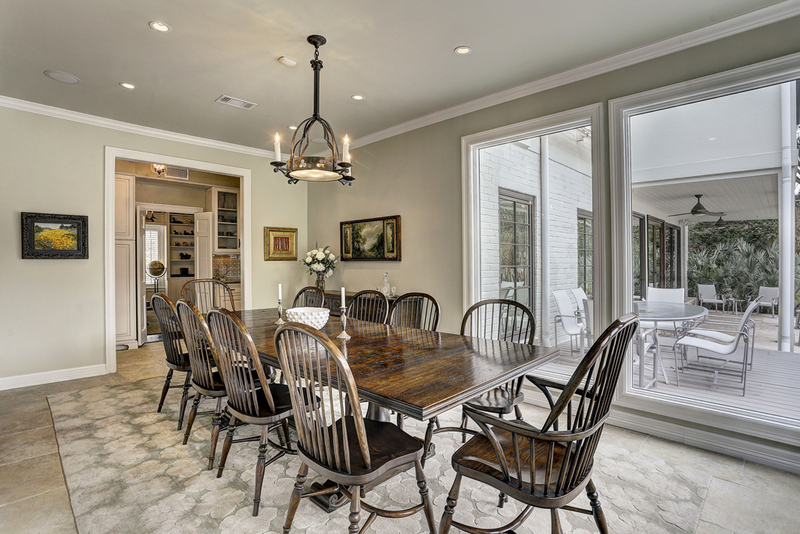 Bayou Woods homes offer 4 to 8 bedrooms, spread over 5,000 to more than 10,000 square feet of living space. Prices for Bayou Woods homes for sale mostly start at $1,000,000. The most expensive properties in the area can cost upwards of $5,000,000. Nestled just outside the Loop, Bayou Woods sits about 6 miles west of Downtown Houston. The neighborhood is south of Interstate 10 (Katy Freeway) and west of Loop 610. 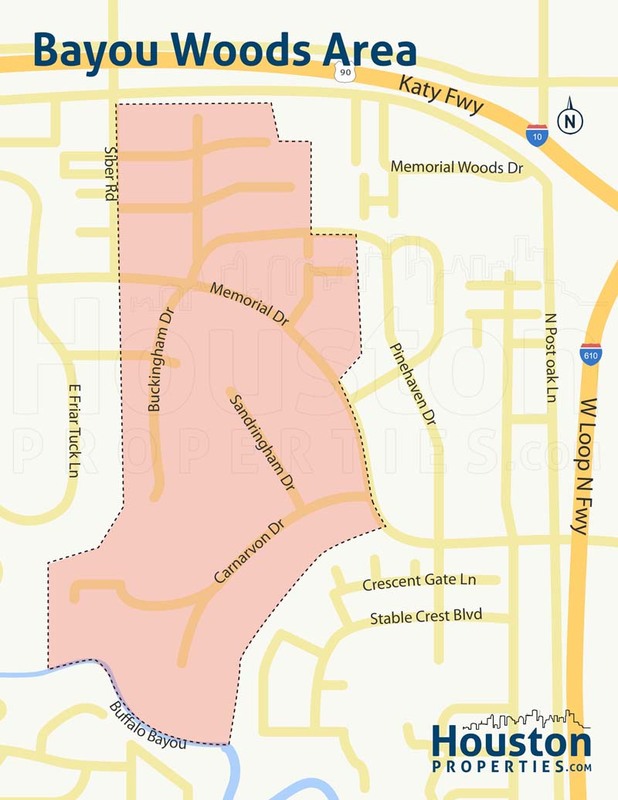 The neighborhood sits to the northwest of Stablewood and east of the Memorial Villages. Memorial Park is a few blocks away from Bayou Woods. Located within the affluent Memorial area, Bayou Woods is among the most expensive neighborhods in Houston. Forbes named the 77024 zip code among the most expensive places to live in the US. The neighborhood is also minutes away from the Galleria/Uptown area. The district is one of Houston’s main employment and retail centers. It is home to around 23 million square feet of office space, with over 2,000 businesses and 55,000 employees. The district also features 5 million square feet of retail space. The world-famous Galleria is within the Uptown District. It has 2 million+ square feet of leasable space, and features anchor stores like Macy’s, Neiman Marcus, Nordstrom, and Saks Fifth Avenue. Other retail centers are also within minutes of the neighborhood. Another key Houston landmark, Memorial Park, is a few blocks away from Bayou Woods homes. The park used to be a boot camp for the US Army, but today it houses various sports facilities, hike-and-bike trails, the Houston Arboretum and Nature Center, and the Memorial Park Golf Course. 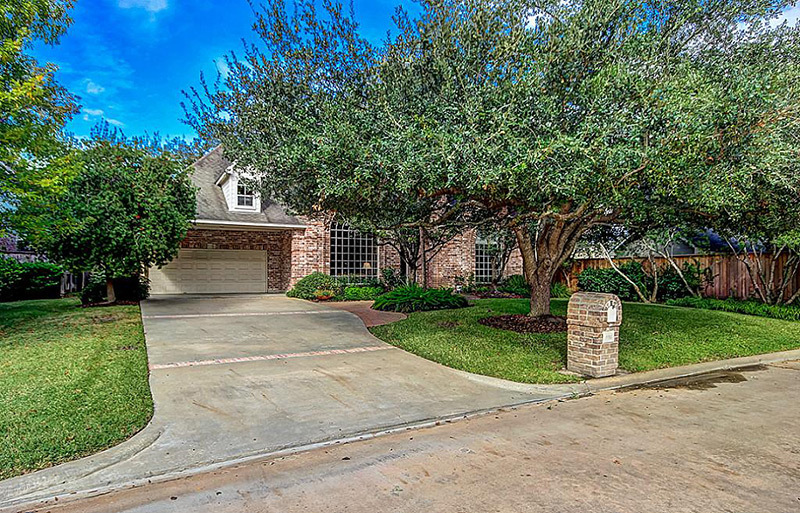 Bayou Woods homes are zoned to schools from the highly regarded Spring Branch Independent School District (SBISD). National Blue Ribbon Schools Hunters Creek Elementary School, Spring Branch Middle School, and Memorial High School all serve Bayou Woods homes. *Note: For a more detailed information on specific schools zoned to different Bayou Woods areas, please refer to our Houston Schools Guide OR email me. Hunters Creek Elementary School at 10650 Beinhorn Rd. Hunters Creek Elementary is one of the SBISD’s multi-award winning schools. It was named National Blue Ribbon School in 1993-94. It features several academic programs, like Gifted & Talented and English as a Second Language (ESL), among others. Spring Branch Middle School at 1000 Piney Point Rd. Spring Branch Middle School is located in Hedwig Village. Known for its academic excellence, the school has been named a National Blue Ribbon School (1997-98), a TBEC Honor Roll School (2008), and a TEA Recognized Campus (2008-2010). Memorial High School at 935 Echo Ln. Opened in 1962, Memorial High School is the oldest high school in the SBISD. It has since received several awards, including the TAKS Gold Performance Award (2012) and College Readiness Award (2008 and 2010). The school is also a National Blue Ribbon School (1988-1989), an Honor Roll School, and a High Performing School (2008 and 2009). The following are some of the more notable private schools near Bayou Woods. St. Michael School at 1833 Sage Rd. Al-Hadi School of Accelerative Learning at 2313 S Voss Rd. Strake Jesuit College Preparatory at 8900 Bellaire Blvd. Primrose School at the Galleria at 5015 Westheimer Rd. St. Theresa Catholic School at 6623 Rodrigo St.
To find an updated listing of all Bayou Woods real estate zoned to any specific public school, please send an email to Paige Martin at Paige@HoustonProperties.com with the property preference and budget that you’re working with. 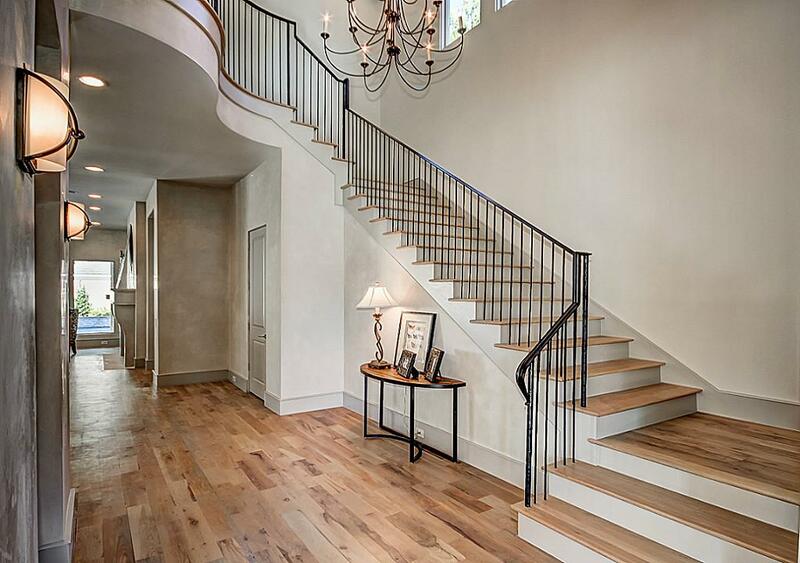 With a median sales price of over $4,500,000, Bayou Woods homes are among the most expensive in Houston. Like in most Memorial close-in neighborhoods (like Stablewood and Tanglewood), home inventories in Bayou Woods are fairly limited. Very few homes are put on the market every year and there have been fewer than a dozen public single-family homes sales in the neighborhood over the last 2 years. Note: There have been less than 20 Bayou Woods single-family homes sold in the past couple of years. Since there are so few average public sales per year, email me for more updated real estate trends. 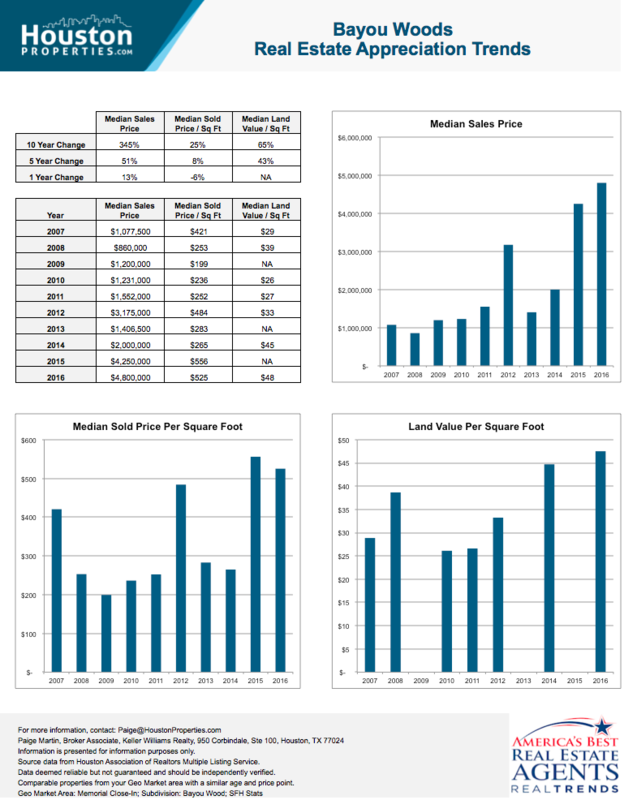 For updated information regarding Bayou Woods real estate pricing and trend analysis, please contact Paige Martin at Paige@HoustonProperties.com. Bayou Woods homes are fairly similar to those in other Memorial close-in neighborhoods like Tanglewood and Stablewood. Homes often offer spacious living spaces and sit on large verdant lots. Some of Bayou Woods’ original homes date back to the 19950s and 60s, though many have been updated and renovated. Others have been torn down to make way to bigger custom-built homes. Older homes in the neighborhood are typically traditional ranch-style homes, while newer homes draw from more contemporary and modern designs. On average, single-family homes in the area can offer between 4 to 8 bedrooms spread across 5,000 to more than 10,000 square feet of living space. Lot sizes are equally generous, ranging from 20,000 square feet to upwards of 100,000 square feet. Luxury amenities are common. Most Bayou Woods real estate feature swimming pools, spacious front and back yards, well-kept grounds, wide setbacks (with some homes are tucked well behind mature trees and hedges), wide driveways and multi-car garages, formal and informal dining and living areas, and luxurious master bedrooms. Prices for Bayou Woods homes for sale can start at around $1,000,000. The most expensive homes in the neighborhood can command price tags of well over $5,000,000. Compared to their single-family home counterparts, townhomes in the Bayou Woods area tend to be smaller and more affordable. Complexes and townhome communities in the area include Bayou Woods Townhome Condominiums and Chatsworth Place Townhomes. Bayou Woods townhomes can feature 2- to 3-bedroom floor plans, with around 1,000 to over 2,000 square feet of living space. Most were built during the early 1970s. Prices for Bayou Woods townhomes for sale range from around $80,000 to more than $250,000 (for bigger units). More townhomes are available in surrounding areas like Briar Hollow, Camp Logan, and the Galleria. There are no mid- or high-rise residential buildings in Bayou Woods. There are, however, plenty of condos available in the area. Similar to townhomes, Bayou Woods condos are smaller and more affordable. Prices are also similar to those of townhomes. Like in the nearby Memorial Villages, most of Bayou Woods’ original homes were built in the 1950s and 1960s. During this period, Houston extended its reach westward. The housing boom following WWII brought developers to areas north of the Buffalo Bayou, where they developed upper and middle-class subdivisions. The area now known as “close-in Memorial” (also Memorial close-in) used to be made up of summer homes and country estates. The lush areas around the Buffalo Bayou were then used as stables, hunting lodges, and family retreats. Later, these areas were sold to developers, who built luxury subdivisions and exclusive communities like Bayou Woods, Pinewood Estates, and Sherwood Forest. Today, Bayou Woods (along with most neighborhoods and subdivisions in the Memorial area) is among the most expensive neighborhoods in Houston. Its large homes on sprawling wooded lots and great location near some of Houston’s best dining, retail, and outdoor entertainment hubs continue to draw homebuyers to the neighborhood. Bayou Woods enjoys easy access to some of Houston’s best retail, entertainment, and outdoor activity hubs. Uptown Houston/The Galleria area is about two miles away, while Memorial Park is a few blocks from the neighborhood. Uptown Houston is home to around 5 million square feet of retail space, nearly half of which belongs to the world famous Galleria. The Galleria is home to more than 350 retail, entertainment, and other commercial hubs. Anchor stores include Macy’s, Neiman Marcus, Nordstrom, and Saks Fifth Avenue. Another retail hub in the area is Uptown Park, a European-style shopping center. Upscale shopping and restaurants are available , including M Penner, Mint Kids & Baby, and Facade, among others. Houston’s other shopping hotspots (like Highland Village, River Oaks District, and the River Oaks Shopping Center) are minutes away from Bayou Woods. Memorial Park, on the other hand, is one of the most visited landmarks in Houston. The 1,400-acre park is home to miles of hike and bike trails, picnic areas, swimming pools, tennis courts, and other sports facilities. The Seymour Lieberman Trail and the Houston Arboretum and Nature Park are also within the park. The Memorial Park Golf Course is a municipal golf course opened in 1936. It is a 18-hole course with a course rating of 73 and a slope rating of 122.